Intuit, which sells accounting, and tax preparation software for small businesses, will post first-quarter 2019 results on Monday, November 19. Analysts expect the company to post earnings of 11 cents per share, flat from a year earlier. The company, on the other hand, has guided earnings in the range of 9 to 11 cents per share. During the past four quarters, the company has surprised investors with an earnings beat. It may be noted that the first quarter is Intuit’s weakest quarter, as its clients prepare for the tax season. 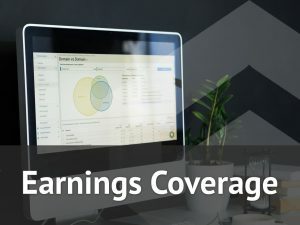 The company is adopting a new revenue recognition standard from the first quarter and is expected to report a top line of $969.2 million, 9.4% higher than last year. The management has guided first-quarter revenues between $955 million and $975 million. The results will primarily be driven by the solid performance of its Quickbooks Online. The accounting software’s subscriber base has seen steady growth over the past few quarters and is expected to increase 40% year-over-year in Q1 to 3.558 million. 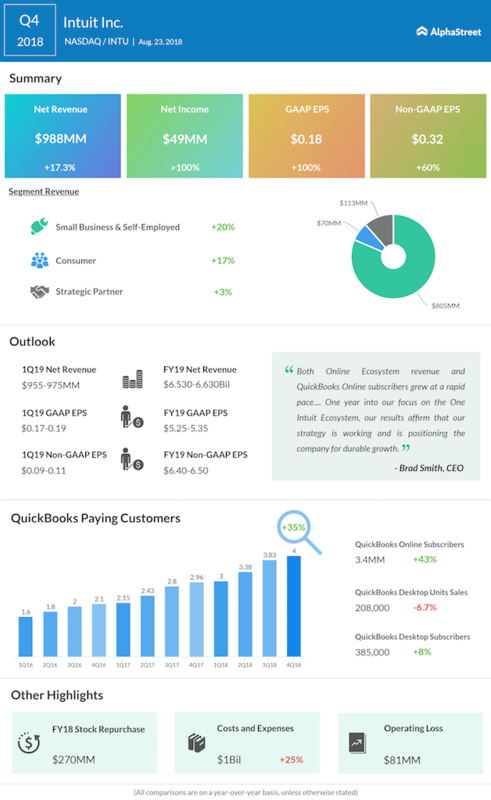 In 2018, Quickbooks Online subscriber base grew 43%. Look out for management expectation for the subscriber additions in 2019. While a slowdown can be expected, a lot will depend on how much the management is optimistic about the product going forward. Riding on this strong growth, the Small Business & Self-Employed segment is anticipated to post revenues of $858 million, a growth of 24%. During the fourth quarter, the segment had reported 20% revenue growth. Meanwhile, the consumer tax segment continues to face stiff competition from rivals including Automatic Data Processing (ADP) and Paycom Software (PAYC). The company is expected to give some updates on how it plans to go ahead with its personal-finance offering TurboTax into the tax season. Separately, Intuit had earlier announced that its CEO is stepping down in January. The news was announced along with the fourth-quarter results and is by now absorbed by the market. However, upcoming CEO Sasan Goodarzi’s plan of action, if any updates are revealed, is likely to create stock fluctuations.